The Nuclear Regulatory Commission approved the construction of two new reactors at Georgia's Vogtle plant. It's the first new construction license for a reactor granted in over 30 years. NEW YORK (CNNMoney) -- The U.S. Nuclear Regulatory Commission approved licenses to build two new nuclear reactors Thursday, the first authorized in over 30 years. The 5-member NRC voted in favor of the licenses four to one, with Chairman Gregory Jaczko dissenting. Jaczko said the new licenses don't go far enough in requiring the builders to incorporate lessons learned from the Japanese nuclear disaster last year. Although new nuclear reactors have come online in the United States within the last couple of decades -- the last one started operation in 1996 -- the NRC hasn't issued a license to build a new reactor since 1978, a year before the Three Mile Island accident in Pennsylvania. Reactors that have opened in the last decades received their initial licenses before 1978. The combination of the Three Mile Island incident and the high costs of nuclear power turned many utilities away from the technology. 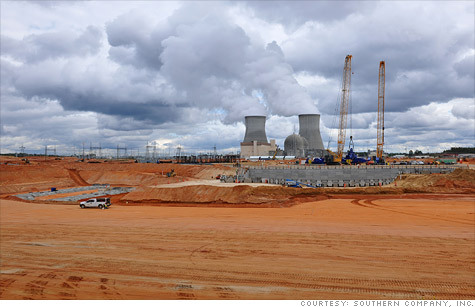 The utilities building the new Vogtle reactors submitted their application seven years ago. Prep-work at the site has been under way for some time, but construction on actual reactors couldn't begin until the final license was issued. The new reactors are a Westinghouse design called the AP 1000. Together they are expected to cost $14 billion and provide 2200 megawatts of power, according to a spokesman for Southern Co. That's enough to power 1 million homes. The plants are being built with the help of a conditional $8.3 billion loan guarantee from the Department of Energy. The loan guarantee is part of DOE's broader loan program that has been criticized for backing companies like Solyndra, the bankrupt maker of solar panels. The Southern spokesman said the loan guarantee, combined with other regulatory measures, enable the project to receive cheaper financing that will ultimately save ratepayers $1 billion. The first reactor is expected to come online in 2016 and the second one in 2017, according to Southern Co. The AP 1000 is the newest NRC-approved nuclear reactor. This would be the first one built in the United States, although four are already under construction in China, said Scott Shaw, a Westinghouse spokesman. Critics have said the containment walls of the AP 1000 aren't strong enough to withstand a terrorist attack, but Shaw says they were redesigned after September 11, 2001 and have held up during simulations. He also said the design's passive cooling system makes it much safer than older designs. The AP 1000 uses gravity and condensation -- not electricity -- to cool the fuel rods. It was the loss of electric power that led to the meltdown of Japan's Fukushima Daiichi reactors following the tsunami in 2011. Still, a coalition of nine mostly regional anti-nuclear groups say the current design is not safe. They plan on challenging Thursday's decision in federal court. In addition to fears of a meltdown at a nuclear power plant, critics also point out that the nation still has no long term plan for the disposal of nuclear waste. The waste, which is highly radioactive, is currently stored at the plants themselves while the federal government continues its decades-long search for a permanent disposal facility. Nuclear power provides the country with about 18% of its electricity. Coal is the nation's largest source for electricity, providing 43% of our energy, while natural gas makes up another 25%, according to the Energy Information Agency. Renewables make up the remaining 14%, with hydroelectric dams accounting for more than half of that. Wind accounts for about 3% and biomass (think paper mills or agricultural plants) another 2%. Solar and geothermal make up under 1% of American electricity production, according to EIA. In addition to the Vogtle plant, 16 other plants across the country have applications with the the NRC to build 25 more reactors. Most of those reactors would be built at existing nuclear power plants but there are two applications submitted for brand new nuclear plants -- one in Levy County, Fla., and another outside Gaffney, S.C.
Environmentalists are split when it comes to nuclear power. Many are weary of it, citing the safety, cost and waste disposal concerns. Others favor it on the grounds that it can provide massive amounts of power that's basically greenhouse gas-free. "Moving away from fossil fuels in order to address climate change is the biggest challenge facing our power sector, and safe nuclear power will be an important part of that solution," Richard Caperton, director of clean energy investment at the left-leaning Center for American Progress said in a statement. But, underscoring the dichotomy, he added: "If the new reactors are not brought online in a timely and cost-effective manner, as often happens with nuclear plants, those consumers could see their electric bills skyrocket."